The Churchill Project - Hillsdale College > Articles > Q & A > Churchill and America > Did Churchill Ever Make Public Criticism of Americans or America? “In proclaiming him an honorary citizen, I only propose a formal recognition of the place he has long since won in the history of freedom and in the affections of my—and now his—fellow countrymen….By adding his name to our rolls, we mean to honor him—but his acceptance honors us far more.” — President Kennedy, Washington, 9 April 1963. 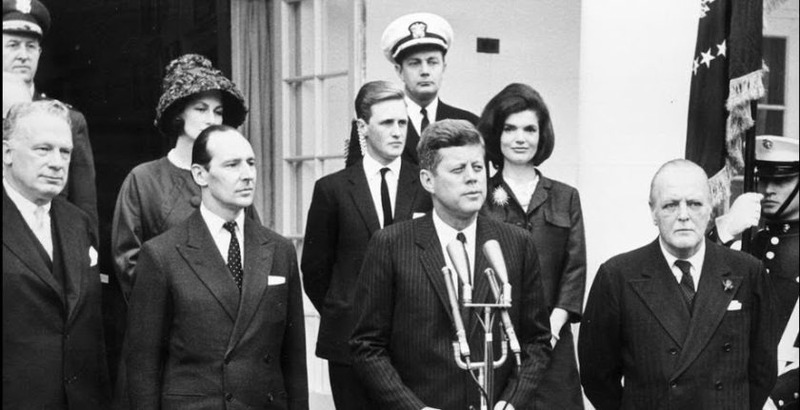 L-R: Acting Secretary of State George Ball, Lady and Ambassador Sir David Ormsby Gore, Winston Churchill (grandson), naval aide Tazewell Shepard, John Kennedy, Jacqueline Kennedy, Randolph Churchill. “It is not open to the cool bystander…to set himself up as an impartial judge of events which never would have occurred had he outstretched a helping hand in time.” —Churchill, The World Crisis, vol. IV, The Aftermath, 1929. Frustrated over war strategy differences shortly after Pearl Harbor, he waxed philosophic: “In working with allies, it sometimes happens that they develop opinions of their own.” Yet even this “outburst,” on 27 January 1942, was delivered in a secret session of the House of Commons.2 In published books and articles he was more direct, but even there his criticism was tempered. Churchill’s love affair with what he routinely referred to as “The Great Republic” began with his first visit to the United States in 1895. There he was welcomed by his mother’s friend Bourke Cockran. At forty-one, Cockran was a Democrat Member of Congress and a maverick politician like Churchill himself soon would become. Later, during visits to America between the world wars, Churchill became impressed with the vastness, energy and potential of his “mother’s land.” He wrote witty articles on his travels, with titles like “Land of Corn and Lobsters.” He concluded that the country’s potential was unmatched in the world. Though he had quietly despised Joseph Kennedy, America’s defeatist Ambassador to Britain in the early part of World War II, Churchill admired the younger Kennedys. These included Kathleen, who died in a plane crash in 1948, and Jack, who as president proclaimed Sir Winston an honorary American citizen in 1963. Churchill was not an uncritical lover. Though he carefully avoided public criticism, he had harsh words in private for certain American institutions. Frequently though privately, during World War II, he railed against American military decisions. For him, Britain’s unwritten constitution symbolized the British tendency to see things in shades of grey. The Americans, he complained, always viewed things in black and white. Churchill repeated those lines almost word for word a year later. Although he often retreaded a favourite phrase, this is one of the few cases where he repeated an entire paragraph. He knew his subject well. 1 Richard M. Langworth, ed., Churchill by Himself (New York: Rosetta Books, 2013), 129. 2 Winston S. Churchill, Secret Session Speeches (New York: Rosetta Books, 2013), 79. 3 Winston S. Churchill, “While the World Watches,” Colliers, 29 December 1934, republished as “Roosevelt from Afar,” in his book Great Contemporaries, revised and extended edition, 1938. The essay was diplomatically deleted from wartime editions of Great Contemporaries, but reinserted in postwar editions. 4 John Colville, Fringes of Power: Downing Street Diaries 1939–1945 (New York: Norton, 1985), 348. 5 Harold Macmillan, Riding the Storm 1956–1959 (New York: Harper & Row, 1971), 175. 6 Sir Anthony Montague Browne, conversation with the author, 1983. 7 Caspar W. Weinberger, conversation with the author, 2001. 8 Harry Flood Byrd, Jr., “In History: Indelible Impression,” International Churchill Conference, Richmond, Virginia, 2 November 1991. 9 Langworth, Churchill by Himself, 127.